Yucca macrocarpa (Torr.) Merriam, in N. Amer. Fauna 7:358 ( Name only) 1893; Cov., U.S. Natl. Herbarium Contrib. 4:202 1893 (Calif. and Nev. plants). 1983 Not Yucca macrocarpa Engelm. 1881. Coastal Southern California and Northern Mexico eastward into North Western Arizona and Southern Nevada. It grows together with Artemisia californica, Opuntia spp. Yucca brevifolia, Yucca baccata, Yucca whipplei, Coleogyne ramosissima, Larrea tridentata, Eriogonum fasiculatum, Rhus ovata. 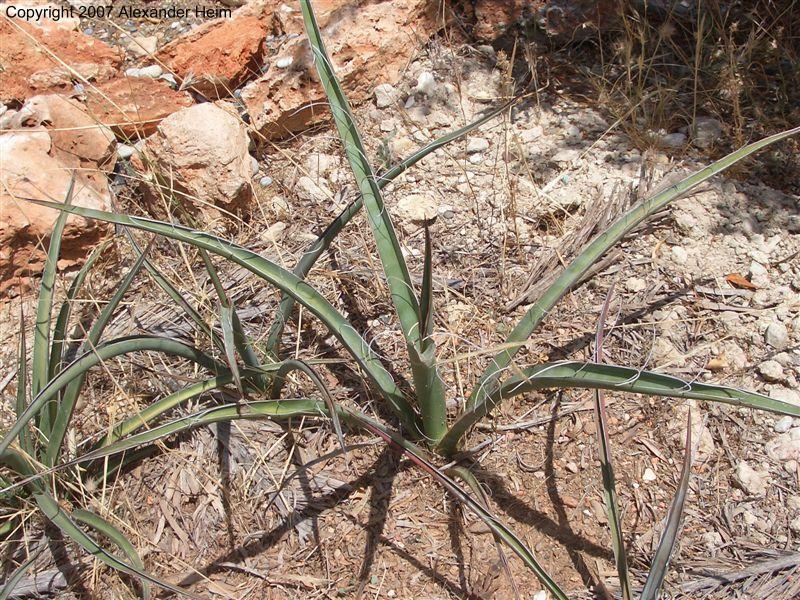 on dry rocky slopes, mesas, sandy desert washes, and bajadas from 670 to 1500 m.
Plant arborescent or shrub like, with single or clumped erect stems, 280 to 450 cm tall (occasionally up to 900 cm tall!). Leaves linear to linear-lanceolate, concavo-convex, thick, very rigid, yellow-green to blue-green, 30 to 150 cm long, 2,5 to 5 cm wide, Leaf margin thick with coarse somewhat curled fibers. The dead leaves along the stems often extend nearly to the ground. Inflorescence densely crowded, glabrous to slightly scabrous, 65 to 130 cm tall, pale yellow-green with a red or purple tinge.. Flowers globose (round), 2,5 to 4,5 cm long, white to cream, often tinged with lavender or purple. Fruit fleshy, cylindrical, 9 to 11,5 cm long, 3 to 3,8 cm thick . Seeds ovoid, thick, dull, black, 0,6 to 0,9 x 0,8 x 1,1 cm, wing less. I don't know how hardy this plant will be in Denmark, but it may probably be hardy in an unheated greenhouse, if planted in a well drained bed. Northeast of Las Vegas Nevada. Grown in Alexander Heim's garden in his Greece. Copyright 2007 Alexander Heim. Here are some links to link to one of Tom Schweich pages about Eastern Mojave Vegetation. Some unusually tall specimens in lower Wild Horse Canyon. Close up of flowers, photograph taken near Hole-in-the-Wall. 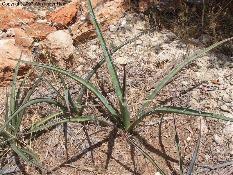 #1349 Yucca schidigera, California, Victorville, fh 1179.77 sown 2000.
! Photo gallery ! Yucca ! Hardy Cactus ! E-mail ! DANSK ! Home ! Caudex index ! Cucurbitaceae (Danish text!) ! Links ! Search ! NEWS ! Wanted !